The hacker group that exposed holes in McAfee's website knows it's breaking U.S. law, but vows to continue exposing vulnerabilities, especially on security vendor websites. "We do understand performing security testings without authorization is illegal under U.S. law," stated YGN Ethical Hacker Group, when contacted by Network World via e-mail. The outfit's own website describes YGN as a "small group of young but mature people" based in the country of Myanmar (Burma) who started working together about three years ago. Based on its website advertising, the group, which seeks to emphasize its goals are "ethical," appears to offer vulnerability-testing services while also working on security testing tools. Burmese needs to be translated into Burmese. Did you get confused? Please read on for the whole story to understand why. 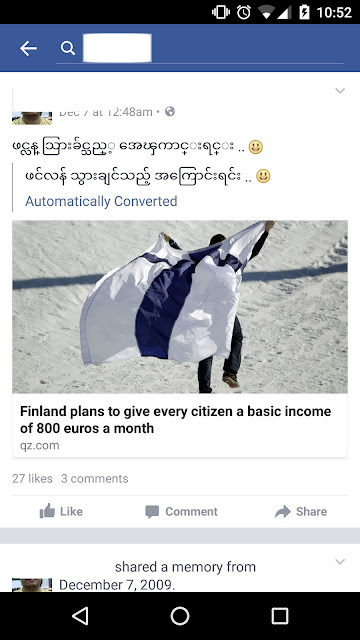 Facebook introduced translation into Burmese in its latest Mobile Facebook app (version 57). You can choose to translate stories into a particular language, and Burmese is one of them. What translation into Burmese does is converting the posts written in Zawgyi into standard Unicode encoding. Zawgyi is a very popular font encoding used by most Burmese online. It's not an official Unicode standard and breaks the standardization. However, it caught on early and became very popular before the Burmese Unicode standard was fully developed and supported by vendors. Most Burmese use Zawgyi on Facebook and everywhere online. "ဖက်ဒရယ်ဒီမိုကရေစီ ပြည်ထောင်စုရဲ့အမည်ကို ဖက်ဒရယ်ဒီမိုကရေစီ ပြည်ထောင်စု မြန်မာနိုင်ငံ ဟု ခေါ်ဆိုရာတွင် မြန်မာနိုင်ငံဟူ၍ဖြစ်စေ ဗမာနိုင်ငံဟူ၍ဖြစ်စေ အင်္ဂလိပ်ဘာသာစကားဖြင့် Burma သို့မဟုတ် Myanmar ဟူ၍ဖြစ်စေ သုံးနှုန်းခေါ်တွင်ခြင်းသည် ပြည်ထောင်စုနိုင်ငံအတွင်း နေထိုင် လာခဲ့ကြသည့် တိုင်းရင်းသားလူမျိုးများနဲ့ လူမျိုးတမျိုးဖြစ်သည့် ဗမာအမျိုးသားများကိုသာ ရည်ညွှန်းနေ ပါသည်၊ ဗမာ နဲ့ မြန်မာ ဆိုတဲ့ဟာကတော့ အတူတူပဲဆိုတာ အားလုံးလည်းသိကြပါတယ်၊ မြန်မာဆိုတာ ဟိုးအရင်က သုံးနှုန်းတဲ့ဝေါဟာရဖြစ်ပြီးတော့ ဗမာဆိုတာ ဒီနောက်ပိုင်းမှာသုံးနှုန်းတဲ့ ဝေါဟာရဖြစ်ပါ တယ်။ သို့ဖြစ်ပါ၍ စစ်မှန်သောဖက်ဒရယ်ဒီမိုကရေစီ ပြည်ထောင်စု တည်ဆောက်ရာတွင် နိုင်ငံအတွင်းရှိ တိုင်းရင်းသားလူမျိုးများ အားလုံး၏ တန်းတူညီမျှမှုကို ဖော်ဆောင်နိုင်ရန် ထိုတိုင်းရင်းသားလူမျိုးများ အားလုံးကို ကိုယ်စားပြုနိုင်မည့် အမည်နာမအသစ်တစ်ခုကို ဆွေးနွေးသတ်မှတ်သင့်ပါတယ်"